Western colonialists and imperialists have for centuries pillaged and taken the lands, territories and natural resources of Indigenous Peoples (and the rest of the world) with impunity. This impunity extends to the pillage of people themselves through forced labor and slavery. Successor States as they gained independence continued the practice with the same impunity on Indigenous Peoples living within their borders. Faced with the reality of unresponsive neo-colonialist States, Indigenous Peoples approached the international community to seek relief, first to the League of Nations where they were ignored. Later, in 1974 the American Indian Movement (AIM) set up an office in New York UN Headquarters. And when the International Court as well as the United Nations General Assembly in New York proved equally unresponsive AIM went to Geneva and the then Commission on Human Rights. There the Sub-Commission on the Prevention of Discrimination and Protection of Minorities was responsive. After two World Conferences on Indigenous populations, the Sub-Commission created the Working Group on Indigenous Populations in 1982 that began to examine annually the condition and plight of Indigenous Peoples and to draft the United Nations Declaration on the rights of indigenous peoples. We approach colonialism in all its forms as subjects of human rights because it is an important option open to us, then as now. But we would prefer a more affirmative and definitive response. 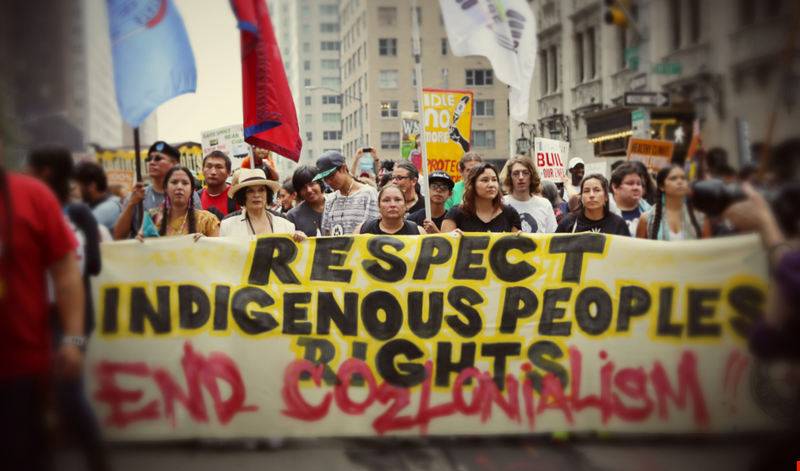 As it is, the human rights arena has proved responsive and brought some much needed attention to the condition and plight of Indigenous Peoples. From less than 10 indigenous representatives to the first Working Group meeting in 1982, attendance grew to thousands and created a global network raising a great deal of consciousness amongst ourselves and the rest of the world. Now that we know our rights they are truly ours and justify our struggle. But it continues to be a struggle. Human rights, given the millennial history of humankind, are relatively new. It has been only since 1946 that the international community adopted standards of behaviour applicable to all States and governments, on the just and proper treatment of their populations. Given the continuing reality of genocide, racism, extreme poverty, human trafficking, mega-destructive mega-extraction, perpetual war, the prevalence of torture, the inferior social status of women in many countries, and a great many other ills, international human rights, like the Geneva Conventions may be more aspirational than they are tools to achieve justice and curb arbitrary State power. For Indigenous Peoples they are not merely tools, but given the reality of their situations, respect and observance of indigenous rights in many respects is not merely the tool but the desired end. International human rights as described and defined by the United Nations are a western construct. This Western construct bases human rights on the “equal dignity and rights” of all of humanity by virtue of their birth. This construct does not recognize collective rights as human rights. To this day, the European Union (EU), United States (US), United Kingdom (UK) and other western States fight any reference to Indigenous rights as human rights even to the names given to the Special Rapporteur on the rights of Indigenous Peoples, as opposed to the Special Rapporteur on the “human rights” of indigenous peoples. Nonetheless, they do recognize that collective rights are rights, but not human rights. It is this Western construct that Indigenous Peoples have had to contend with as they seek some form of relief from neo-colonialism. This is reflected in the name of the Working Group on Indigenous Populations. For decades we were referred to as “populations” or “people.” We struggled for decades to add the “s” on people, because the word “Peoples” internationally implies the rights of Self Determination, a fixed territory and sovereignty over natural resources, among other important political rights. This struggle for the “s” was won when the General Assembly adopted the United Nations Declaration on the rights of indigenous peoples. Moreover, the UN Declaration on the rights of indigenous peoples (2007) was negotiated directly with Indigenous Peoples’ representatives for 25 years. It requires the Free, Prior and Informed Consent in 6 of its articles, including article 32, which recognizes Indigenous Peoples’ own right to development and requires FPIC “prior to the approval of any project affecting their lands or territories and other resources…” Indigenous Peoples have struggled against colonialism and oppression for 525 years. The articulation of FPIC is part and parcel of that struggle. Before they can take, they now have to ask. And more importantly, we can say NO. But human rights violations, including gross and massive violations occur daily, all over the world. It is as though what happens at the Palace of Nations in Geneva, Switzerland, the United Nations headquarters for international human rights, stays in Geneva. There is the world as it should be and the world as it really is. FPIC is now firmly established in UN human rights jurisprudence. This jurisprudence lends credence and credibility to the just demands of communities in struggle. It is not merely a right of participation. It is meant to be dispositive. But it is Indigenous communities who must implement their rights locally. FPIC is our right and it is up to us to make it real in each and every indigenous community. When we were negotiating the Draft Declaration we believed that the right of Self Determination would be the major battle. It turns out that States appear content with the autonomy of Indigenous Peoples where their lands have been demarcated and titled. It is the right of Free, Prior and Informed Consent, an aspect of Self Determination, that is the major battleground where lands and territories have not been recognized as indigenous. Indeed, some of us believe States are delaying demarcation and titling all over the world in order that FPIC not apply to their plans for their development. • “Free” means that there is no coercion, intimidation or manipulation in the acquisition of consent. • “Prior” means that consent is to be acquired in advance of any authorization or commencement of activities. It also calls for respect for the time requirements of Indigenous Peoples’ and their own internal traditional decision making processes. • “Informed” means that the information provided is understood, and where required, in the appropriate indigenous language; that the information covers the full range of proposed activity, including the nature, size, pace, reversibility and scope of any proposed project or activity; the purpose of the project as well as its duration; locality and areas affected; a preliminary assessment of the likely economic, social, cultural and environmental impacts, including detrimental impacts and potential risks; the personnel likely to be involved in the execution of the project; and the procedures the project may entail. • Good faith consultation and full and effective participation by Indigenous Peoples directly affected, and their use of traditional decision-making process are crucial components of the consent process. • “Consent” may be withheld without penalty or prejudice. There are some, many non-indigenous, who consider FPIC a “failed” right” that leads to perverse consequences. FPIC is not a “failed right.” In the mind of many, there is no such thing as a “failed right.” If that were so, the right to life, freedom from torture or hunger, the entire panoply of human rights are failed rights. The perverse results of the respect and observance of any human right, including FPIC, are due to the perversity of bad faith on the part of States that pretend to implement human rights with a corrupt and insidious intent to undermine rights and human dignity for their own ends, usually economic, usually to maintain and/or enhance their power. The corruption of the consultation process required by FPIC is a frequent State response to FPIC. Under the pretence of compliance, some states have one or two day “consultations” not directly with the affected Indigenous Peoples but with Indigenous Peoples, unions, investors and non-indigenous communities, and a host of State agencies and employees, all in the same room, all in consultation together. Indigenous Peoples and their communities are out-numbered and out-voiced by those whose economic interests would be served by the proposed project. These same or other States call for “consultations” that are not consultations at all but briefings on what the State and their corporate clients will be doing. In many of these “consultations” there is no opportunity for the indigenous community primarily affected to consent or not. In others, the State cites merely “broad community support” for the project. Worse, through their State agencies and Governmental Non-Governmental Organizations (GONGOs), they employ indigenous persons to agitate within communities promising benefits, such as employment and land titling, creating divisions and conflict between and within indigenous communities themselves, shattering the fabric of the community and then sadistically announce that the project will continue as the community “cannot make up its mind” and/or “broad community support” for the project. There are a great many artifices such as these that States are known to use to avoid the true intent and purpose of FPIC. These and other artifices are known and practiced in climate change policies and the imposition of false solutions for the climate crisis such as the mechanism called Reducing Emissions from Deforestation and forest Degradation (REDD+). Since 2007, the REDD+ program has been proposed and implemented by UN climate negotiations. The UN-REDD programme together with the World Bank Group’ Forest Carbon Partnership Facility have been major actors in the promotion, implementation and funding of REDD+ among developing countries. REDD+ advertises discourses of “informed and meaningful” involvement of all stakeholders, including indigenous and other forest-dependent communities as well as respect to indigenous rights. It does not promise but merely “recommends” FPIC. However, REDD+’s unabashed purpose has been to include the carbon sequestration properties of forests and standing trees into carbon markets to offset industrial pollution. This has resulted in more and more Indigenous land being targeted for this purpose. Primarily through funding from Norway, Indigenous Peoples’ organizations have received millions of dollars ostensibly for capacity building on REDD+ on and in Indigenous territory. 2—forest management projects, “green grants” or REDD+. The fault of REDD+ lies not only with a purposeful avoidance of the right of FPIC but artifices employed in order to avoid its true implementation. Such artifices include the creation of conservation areas or national parks, with title held by the States, obviating the rights of the indigenous ancestral inhabitants, allowing the State to do what it wants to do with its “own” land. Even assuming good faith consultations leading to consent questions also remain such as the settling of disputes between the owners of carbon credits, the State and Indigenous Peoples denied the fair use of their forests. Will Indigenous Peoples be able to get out of legally enforceable but unforeseen or unwanted interference with their traditional way of life? In this context, who owns the trees? What happens when the carbon market busts as has been the case? National courts as the arbitrator cannot be counted on to deal fairly with Indigenous Peoples. It is not FPIC that is a tool to the grabbing of indigenous lands and territories. It is the bad faith, corruption and economic interests of the economic elites of States and corporate clients. It is the same old colonialism and its immoral and deceitful age old practices that Indigenous Peoples have faced for 525 years. It is new wine in old bottles of greed and corruption and the racism necessary to justify their impunity and the dehumanization of Indigenous Peoples. Colonialism continues to divide Peoples and communities to achieve its ends. But in spite of many losses colonialism will never conquer. Colonialist political, economic and military power and economic interests, the States and their elites, never has been a level playing field for Indigenous Peoples. Yet we continue the struggle of over 525 years. From Standing Rock, North Dakota, US, in our defense of Sacred Water against oil development and infrastructure, to indigenous Lenca Territory in Honduras in defense of their Sacred Water against mega hydroelectric dams, to indigenous Mapuche Territory in Argentina and their struggle in defense of their Sacred Water and against fracking, all over the world, Indigenous Peoples are owning their right to Self Determination and demanding the definitive right to say NO. By their demands they contribute directly to the struggle against global warming. We invite all peoples of good faith to join us in defending our Mother Earth, our Sacred Water, our environment, our forests, and our continued existence as Peoples. Today, from the legal point of view, it can be categorically stated that if there is no Indigenous Consultation in Mexico there can be no total or partial renegotiation of the NAFTA that could be deemed valid. Without the meaningful participation of the Indigenous Peoples of Mexico, there is a set of national and international standards that make the total or partial renegotiation of NAFTA legally impossible.